Vasectomy in Cebu | No-Scalpel Vasectomy International, Inc. 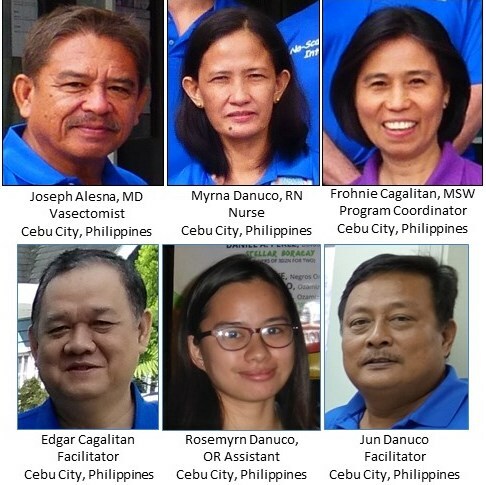 The local Team holds a Regular Free NSV Clinic, usually on the 3rd Saturday of the month at Sacred Heart Hospital (SHH) on Urgello Street, a Training Hospital of Southwestern University PHINMA in Cebu City. NOTE: PhilHealth pays for vasectomy! Any person with PhilHealth Insurance can have his vasectomy performed by the NSVI Domestic Team at Sacred Heart Hospital clinic on the third Saturday of the month. Please call Myrna Danuco, RN at 0927-222-0906. 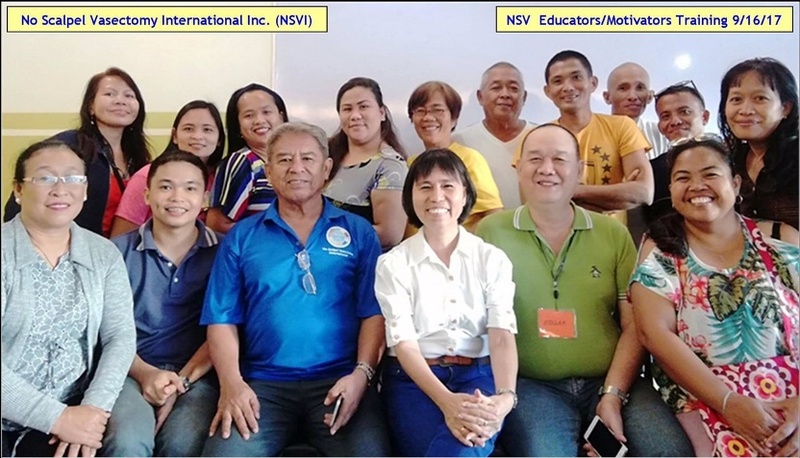 The Cash for Successful Education on NSV (C4-SEN) is a Livelihood Assistance Special Project of NSVI, which is an opportunity offered to men who have had vasectomy already. This is similar to the government’s Conditional Cash Transfer or the 4Ps or Cash for Work/ Food for Work. The aim is to provide the NSV Men with extra income, esp. those with low or no definite income who are willing to volunteer. They will educate their fellow fathers, especially the low-income men who intend no more additional children. Those who have had NSV are expected to be more credible as educators. Community Health Workers and others who are willing to educate/motivate on NSV, can also have extra income. With the economic situation, it would be good to also help them financially for educating others, once they learn about vasectomy. This Special Project hits 2 birds with one stone! It addresses at least 2 social problems in the Philippines: Poverty and Overcrowding due to a high rate of unintended pregnancies. The NSV Educators / Facilitators are provided with BROCHURES that serve two roles. (1) They serve as a guide for helping the Facilitators educate men about vasectomy. (2) They serve as documentation of education by the Facilitator who writes his or her name on the brochure. When a vasectomy patient brings the brochure on the day of his vasectomy, the Facilitator whose name is on the brochure receives 500 pesos for offering his or her time to educate the patient. Each man who undergoes vasectomy is offered BROCHURES if he would like to serve as an Educator / Facilitator. When he runs out of brochures, he can always get more from Frohnie or Myrna. Community Health Workers can also receive BROCHURES from Frohnie or Myrna by contacting them at the numbers below. The NSV client who is a daily wage-earner or has no definite income will receive P1,500.00 as Income-Replacement to be used by the family for food, etc. as he will be advised not to do heavy work / lifting or strenuous activity until 2-3 days after the vasectomy. At the completion of each vasectomy clinic, Patients and Motivators are paid, as are our staff and the facility. The total for each vasectomy is about $75, varying with the exchange rate. So if you would like to DONATE, rest assured that a donation of $750 will provide vasectomy services for 10 men. Those men will be able to better provide for the children that they already have, thereby enhancing the quality of life for their families and Philippine society overall. Your donation will greatly help reduce POVERTY and Overpopulation . 5. Foreigners (non-Filipino nationals) and Filipinos who want a more private experience (with little or no waiting) may have their vasectomies by appointment at Sacred Heart Hospital on the first Saturday of the month. The fee is P 10,000. Payment must be made in cash given to Myrna Danuco, RN, on the day of the procedure. To arrange a vasectomy on a Domestic Program day (3rd Saturday) or by appointment (first Saturday), please contact Myrna Danuco, RN, at 0945-598-7644. For more BROCHURES, contact Myrna Danuco, RN, at 0945-598-7644 or Frohnie Cagalitan, SW’er, at 0923-882-2386.